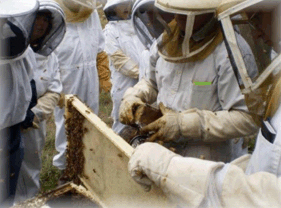 The art of beekeeping is being encouraged through this youth scholarship program. Metro Beekeepers Association (MBA) began scholarships for youth in 2011. To educate youth in the art of beekeeping and to promote a better understanding of the value of honey bees to our environment and to the food chain. To provide an opportunity for youth to experience responsibility and enjoyment through beekeeping. To provide an avenue for youth to engage in an avocation and gain the potential to pursue beekeeping as a sideline or full time vocation. An 11-month beekeeping course and course book. A set of wooden-ware for a beehive. A nuc or package of bees for the hive. Beekeeping gear: hat, veil, gloves, hive tool, bee brush, and bee smoker. Mentoring by a MBA member for one year. Upon successful completion of the scholarship requirements, the recipient(s) will receive a recognition certificate and full ownership of the hive. The applicant must be between the ages of 12 and 18 by September 1, 2017. The applicant and immediate family cannot have any bee colonies prior to 2018. The application must postmarked or e-mailed by December 7, 2017.